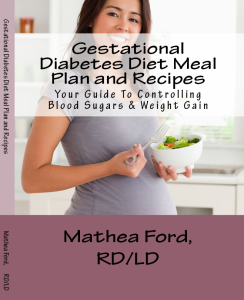 First things first, I want you to have 3 of my dinner recipes for gestational diabetes FREE and I created an Ebook on managing gestational diabetes that I want you to have FREE as well. Go to the green box to the right and I will email it to you. Now, many things come into play when you find out you have gestational diabetes, I know, I had it twice. Outcomes today are just fine. But I want you to understand why I created the Ebook I am giving out for free and why I created “Gestational Diabetes Diet Meal Plan and Recipes” you see over here on the left. I really want to give back to all of you who are going through emotional times with this condition. I found that the support from my OB was horrible so I wanted to create this meal planning book to be a source so no woman is lost and on an island with this condition. Get the FREE stuff and then see what you think about grabbing the meal plan and recipe book! This condition can be a challenge and among all of these changes, the health of the baby growing within you is the biggest concern, and the health of the baby can sometimes become compromised when gestational diabetes is factored into the equation. In most cases, gestational diabetes can be treated through a healthy diet, gestational diabetes diet, though in some cases medication is required to keep insulin levels under control. Regardless, gestational diabetes is something that could have a future impact on the health of you and your child later in life if it is not treated properly. During pregnancy, sometimes the body becomes more resistant to insulin. This leaves excess levels of glucose floating around in the bloodstream. While most women never experience any symptoms of gestational diabetes, there are some risks to the baby if it is left unchecked. Not only can the baby gain too much weight–particularly in the upper body, but gestational diabetes can also lead to weight problems later in life for the child. Untreated gestational diabetes also can cause a baby to be born with extremely low blood sugar levels, as their pancreas will be producing too much insulin at birth. This can lead to convulsions, coma, and even death. Most times, gestational diabetes is asymptomatic in women. In some cases, however, symptoms include increased thirst, increased urination, blurred vision, increased fatigue, weight gain, and nausea or vomiting. They are often mild and go unnoticed during pregnancy, however, as they are often attributed to pregnancy itself. It is usually diagnosed through routine screening during pregnancy–sometime between the 24th and 28th week of pregnancy. This is done with a glucose test starting with a one hour then a three hour if unclear. In most cases, gestational diabetes is treated through diet, gestational diabetes diet. The gestational diabetes diet is more like a lifestyle plan than a diet. It does not involve deprivation or weight loss–rather it is a balanced eating plan which encourages intake of healthy foods and eliminating bad ones. The gestational diabetes diet involves eating 3 small, balanced meals per day and at least 1 snack, sometimes 2-4 snacks depending on the plan. Meals should be high in lean protein and dietary fiber and low in certain types of carbohydrates and sugars. It involves carefully reading labels and avoiding foods that are laden with carbs and sugars. Only a small percentage of women with gestational diabetes will need medication to keep the disease under control. By following the gestational diabetes diet, most women can keep their blood glucose levels within a normal range. * If eating carbohydrates, choose high fiber, whole grain carbohydrates in favor of less healthy carbs. * Eat 3-5 servings of vegetables each day and 2-4 servings of fruit. Choose whole fruits in favor of fruit juices and sauces as they are full of sugar. * Eat 4 servings a day of low fat cheese and dairy. Skim milk, low fat yogurt, and hard cheeses are good options. * Eat 2-3 servings of lean protein per day. This includes meat, nuts, beans, and eggs. 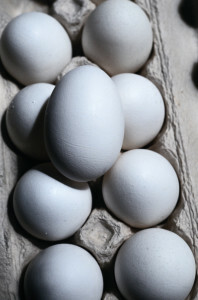 2-3 ounces per serving is sufficient, and avoid fattier forms of protein. * Some fats are good. Don’t completely cut fat from your diet, but avoid saturated fats and oils if possible. If your doctor gives you the okay for exercise, thirty minutes of moderate exercise each day has also been shown to help reduce insulin resistance. Walking is a great way to exercise without putting too much impact on pregnancy-stressed joints and is considered relatively safe even late into pregnancy. Gestational diabetes is one of the most common pregnancy-related illnesses. Many women are completely unaware they have gestational diabetes until they are screened for it later in pregnancy. In most cases, simply eating a healthy, balanced diet will keep the disease under control. A gestational diabetes diet is not one of deprivation and restriction–rather, it is a healthier way to live and a good way to balance yours and your baby’s nutritional needs. 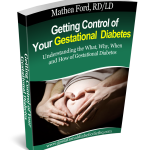 For more on planning your gestational diabetes treatment and diet plan please sign up for my email list and get my FREE EBOOK on gestational diabetes. Gestational diabetes refers to a case where diabetes is recognized during pregnancy. It is common to about 7% of all pregnancies. The diabetes arises during the second half of the pregnancy and goes way after the baby is born. The diabetes may have further complications if not treated during pregnancy. The chances of getting gestational diabetes are greater if one is overweight, if she had gestational diabetes before, if you have a relative(parent, brother, and sister with type 2 diabetes), if one has ever given birth to a child weighing more than 9 pounds, and she is an American Indian, African American, a Pacific Islander American, and Hispanic/Latina. Modifying the diet is the first step that a mother that has the disease should emulate towards when treating the condition. This is essential in maintaining the blood sugar level at a normal range while still taking a healthy diet. Gestational diabetes diet meal plan is done by monitoring the amount of carbohydrates in the diet. This is because carbohydrates are digested to produce glucose, a core factor in fueling the body and nourishing the developing fetus. However, the glucose levels must be controlled so that they stay at a level that is within target. One can maintain blood sugar levels by eating 3 regular meals in a day and 2 to 4 snacks thorough the day. The meals and the snacks must be balanced and more so in the amount of carbohydrates and calories they contain. One must ensure that she eats a good breakfast because the levels of glucose are usually unstable in the morning. However, one must limit carbohydrate and fruit juice intake and eat proteins instead. This should include vegetables, beans, peas, legumes and whole grain breads should make up a large portion of your diet. Usually, milk has high lactose (simple sugar) content and must thus be limited to all the mothers that are working to manage gestational diabetes. One should look for additional sources of calcium and additionally avoid fruit juices and soda because they contain a high level of glucose. Glucose crosses the placenta from mother to baby to meet the energy needs of the developing baby. If mother’s blood glucose levels are raised, a greater amount of glucose crosses the placenta to the baby. To manage this extra amount of glucose, the baby produces more insulin. This can cause excessive growth and fat in the baby. If mom’s blood glucose levels continue raised, the baby size may be larger than normal. Following delivery, the baby might experience low blood glucose levels, mostly if the mother’s blood glucose levels were higher before the birth. Gestational diabetes can be monitored and treated with a gestational diabetes diet meal plan and if well controlled, the risks are greatly reduced.